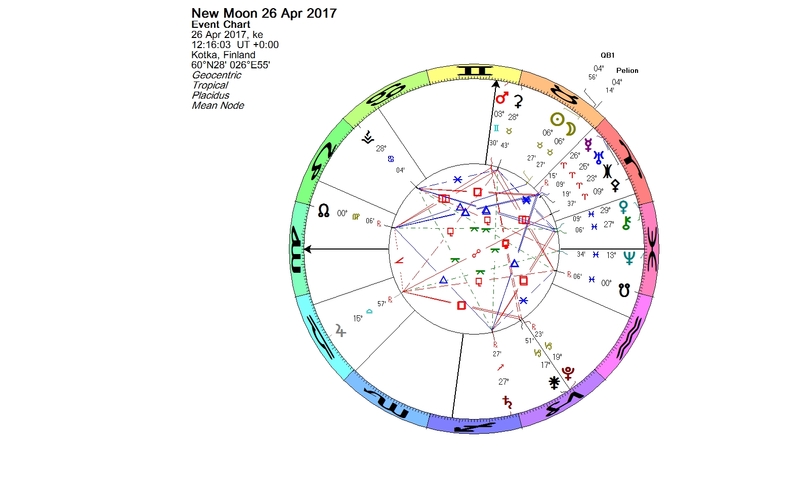 Today was the Taurus New Moon. The Sun and the Moon were in conjunction with two minor planets, a trans-Neptunian object 1992 QB1, and a centaur planet named Pelion. 1992 QB1 was the first body discovered beyond Neptune after the discoveries of Pluto and Charon. Today, 25 years later, the number of TNO discoveries is almost 1800. The orbital period of 1992 QB1 is almost 290 years. Pelion was discovered in 1998. It is a centaur planet with an orbital period of almost 90 years – more than three times shorter than that of 1992 QB1. 1992 QB1 was a remarkable discovery; it proved the existence of the Kuiper belt, which had only been hypothesized till then. Because of this, 1992 QB1 has gained its meaning as a thresholder. It is the bridge beyond the edge, leading to the unknown. Something similar we can associate to Pelion. Mount Pelion was the homeland of Chiron and other centaurs. It was the place where Jason and the Argonauts started their quest for the Golden Fleece. The current New Moon conjunct these two objects can also lead to a brave new beginning. In spite of the considerable difference in their orbital period, 1992 QB1 and Pelion have managed to travel together for two years. The Aries New Moon in 2015 was also in conjunction with 1992 QB1 and Pelion. Please read my blog post then: New Moon in Aries — April 18, 2015. This entry was posted on Wednesday, April 26th, 2017 at 8:20 pm	and is filed under New Moon. You can follow any responses to this entry through the RSS 2.0 feed. You can leave a response, or trackback from your own site.